It’s always tough writing about yourself. I’ll try not to bore the reader here, and will instead confine the subject matter to coins and currency. My first exposure to numismatics was in coins as collectible banknotes came quite a bit later. 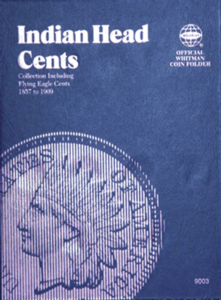 In 1967, when I was 7 years old, I remember my Grandfather giving me a partially completed book of Indian Head Cents on Christmas Day. It was the first time I’d ever seen one of the blue coin album folders by Whitman. As a kid, it seemed like a really neat way to store coins. Each coin would be pushed into a slot corresponding to the coin’s date. Besides the date, each coin space also had the mintage typed underneath the slot. It soon became clear to me that some coin dates had lower mintage’s than others. These lower mintage coins were the key and semi key date coins and would be more costly. My Grandfather had purposely given me many of the tougher coins. This allowed me to locate and eventually complete the set of Indian Head Pennies. That was really the beginning for me. All collectors strive for completion. Completion is the ultimate goal and I distinctly remember putting that last coin into this album. Completing this Indian Head Cent collection really offered me a great amount of pride and satisfaction. So that was really it for me, I was hooked. That’s when I became a collector. During the next 10 years, I spent much of my free time (and hard earned money) completing more coin collections. I had some collector favorites including: Buffalo Nickels, Mercury Dimes, and Standing Liberty Quarters. Each set came with a story and most of the individual coin purchases did too. One of the most memorable was my acquisition of a 1921 Peace Dollar when I was 14, but then like I said, I don’t want to bore you too much here. Then came a lengthy period of time where I actually gave up coins all together. I’ve heard similar stories over and over from other collectors who also took a long break from numismatics as they were involved in college, career and family. For me this break started in 1978 when I started College. Even after college, it wasn’t until 1988 that I got involved with coins again. I remember coming back to my first coin show in the late 80’s. It was a little local coin show on a third Sunday of the month in Coral Springs, Florida. The excitement of walking into this little mall-based show was still there. A lot had changed though in ten years. Dealers were buying and selling certified coins, encapsulated in plastic. It was almost like I had been in some kind of time warp as I had never heard of, let alone seen, a slabbed coin. The idea of a third party, independent coin grading service seemed novel to me. Little did we know the ultimate impact of PCGS and NGC after their start ups in 1986. They would ultimately offer the collector and investor safety and liquidity, two elements that were severely lacking in the opinion based grading of raw coins. The net result wound up being a hugely expanded collector base which was good for both the coin industry and the hobby. Fast forward to the early 1990’s when I lived in Omaha, Nebraska. My coin collecting days had expanded to vest pocket coin dealing and actually setting up (a booth) at local and regional level coin shows. The transition from collecting to dealing came pretty easily for me. I enjoyed buying and selling coins. By 1992 I had given up my “day job” and was dealing in coins full time. It was financially challenging in those early days but it sure was a lot of fun. What happened next was really a pivotal period for me: My introduction to banknotes or collectible paper money.